In The Stanley Parable, Finding The Story Is The Game : All Tech Considered The Stanley Parable is an exploration game, as well as a narrative storytelling experiment, that puts into question the tried and true rules of video games and challenges the player's notions of choice and free will. The Stanley Parable is an exploration game, but it is also a narrative story game, and it is also a game of choice. It is all of these things, yet none of them. This is part of our weekly 'Indie Watch' series of game reviews. Check here on Tuesdays for more posts in the series. The Stanley Parable is an interesting animal in the gaming zoo. Billed as a "first-person exploration game," it is honestly much, much more than that. Originally created as a fan modification (mod in gaming parlance) for the popular game Half-Life 2, it was recently given its own HD stand-alone release for Windows PCs. At its core, the game is an existential experience for both the player and Stanley, the game's pseudo protagonist (but we'll get to that). The game is also an examination, albeit a humorous one, of choice and free will in video games. It's an opinion column, wrapped in an adventure game, wrapped in a piece of interactive fiction; a gaming turducken if you will. This is a story of a man named Stanley. Stanley worked for a big company in a big building, where he is known as employee No. 427. His job was to push buttons on his computer. He was given orders for which buttons to push, when to push them and how often. This is what Stanley did, day after day. Until one day no orders came, and Stanley ventured out of his office to find out why. It is at this point that you take control of Stanley, sort of. As soon as you walk out of Stanley's office to search for his missing co-workers, the narrator begins telling the story, Stanley's story, as it happens. It is when you get to your first choice between two doors that the true charm of this game comes alive. The narrator, brilliantly voiced by British actor Kevan Brighting, tells you what Stanley (or you) did in this part of the story. "Stanley went left," for instance. But here's the thing — you don't have to go left. You can go right, or back the way you came, or not do anything at all, and the narrator responds, often frustrated with you for not following the "rules" of the story. At times he even restarts the game to try and force you to play the story correctly. It's in this way that the narrator somewhat becomes the antagonist of the game; guiding you, or telling you, what to do, what you did, what Stanley is thinking or is not thinking and what the narrator himself thinks of all of the choices you make as you explore the office and try to find the narrative thread. And this is how the game continues, and often ends, with you defying or obeying the narrator while searching for Stanley's story. Depending on your choices, you will encounter everything from a mind-control facility to a museum of the game and its development. It is difficult to convey The Stanley Parable's various messages and idiosyncrasies without spoiling its surprises, of which there are many. Behind the snarky narrator and the clever writing is an open-eyed examination of current video game narratives and their flaws. It's Monty Python meets Call of Duty. When the narrator scolds you for not going in the direction of "his" story, the developers are taking a jab at modern games that, despite a glossy sheen of graphics, voice acting and the illusion of choice, are still basically on rails. Take one of the biggest hits of this year, Bioshock Infinite. It was highly praised for its story and narrative direction. But in the end, it was a very lead-you-by-the-hand adventure. There were no alternative paths, no choices that really led to a different outcome. This was also the case for The Last of Us, another critically acclaimed game. They were great games and I enjoyed both. But they were very linear in design, and this is what The Stanley Parable takes issue with. The Stanley Parable even calls into question the "winnable" nature of video games as the natural ending state. Why must stories, which is what non-sports video games are now, be won? Are books always won? Are movies always won? Is the experience of looking at a piece of artwork ever won? It's these questions The Stanley Parable asks, veiled as those inquiries are behind numbered doors and non-Euclidean hallways, that make it such an interesting and unique gaming experience. Developer Davey Wreden, who created the original mod, says he was inspired to make a game based around narrative elements that were often a part of some games but never the main focus. The quiet moments, between the shooting, are where he found a lot of enjoyment. "That's usually where you found interesting little bits of [a narrative] experimental game ... kind of hidden amongst another game," Wreden says. "It was almost ashamed that it was even there." So he decided to build an entire game around those little bits. 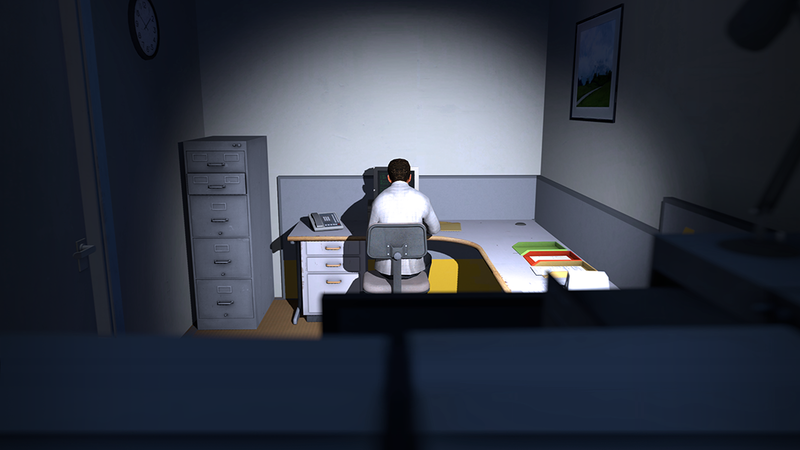 The Stanley Parable's creation was meant to be a steppingstone for post-college work, but it ended up taking much longer and became much more than Wreden had originally envisioned. The positive reception of the mod opened the doors to create the full version. Wreden later collaborated with William Pugh for the game's full release. The response in the gaming industry has spanned a wide spectrum, Wreden says, with some telling him the game changed their life, while others call it a "cancer." "I think that people bring a lot more of themselves to an experience like this than they usually like to admit," he says. While the game is not likely to change the gaming industry tomorrow — nor was that the intention — Wreden and Pugh say that perhaps it can be a reference point for future developers about what is possible. "The change in the industry comes from talking about it," Pugh says. "It gives another reference point, and that helps the conversation." Pugh cites the PS3 game Journey (which was independently developed but published by Sony) as an example of a game that took a risk on something different and really impressed him. It was a game, much like The Stanley Parable, that can't be easily defined. "It adds to the vocabulary of the industry, and I think that's how the change will come," he says. Wreden says he hopes big developers begin to lose the fear of experimenting with new ideas and new concepts and have confidence in taking risks with the technology. "Most of the stuff that's in bigger games is in there because the people making them are afraid, and so here's the default. Here's what's safe," he says. It's that fear, he says, that gives him pause about playing big industry games these days. OK, so you don't really win. But The Stanley Parable is a game worth playing, especially if you are someone interested in game design and narrative storytelling experiments. Just be prepared for something completely different, which in an era of often cookie-cutter shooters and survival horror tropes is a welcome change. "You will follow a story, you will not follow a story. You will have a choice, you will have no choice. The game will end, the game will never end. Contradiction follows contradiction, the rules of how games should work are broken, then broken again. This world was not made for you to understand." And while the world of The Stanley Parable may not be made for you to understand completely, it is a load of fun to try. Or not try. Steve Mullis is an associate Web producer at NPR. If you want to suggest an independent game worth featuring here, please write or tweet him.